This team develops a program to support and develop the agricultural industry. They aid in educating the public about the importance of agribusiness, coordinate the annual Ag Appreciation Banquet, and assist with an annual Ag Tours of the county.The annual Agriculture Appreciation Banquet recognizes Nacogdoches County agribusiness leaders and educators and celebrates the huge role agriculture plays in our economy. 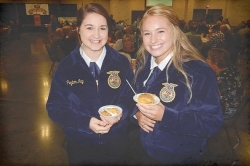 The Agriculture Appreciation & Awareness Banquet presented by TFP Nutrition honors those in Nacogdoches County Ag Industry. Click for information about the 2019 banquet including award honorees and scholarship recipients.